Along with the release of Dominaria, Magic the Gathering Arena (MTGA) is being hit with a major update, and as I promised before, I have dug into the numbers to provide an review on the state of the MTGA economy. The announcement can be found here. You can find my previous articles on MTGA’s economy here and here. I am not going to repeat the introduction from those articles, so please read them if you don’t know how the economy works, or why it needed changing. Let’s get down to business! This is a solid improvement to the MTGA economy. It is now better than Hearthstone, and is approximately competitive with other games in terms of free-to-play collection building. Most competitive decks requiring between 1.5-2 months of play to build under current model. I estimate this patch represents 25% buff for F2P players . If you are looking to pay real life money, most decks are going to cost between 60-100$, which is roughly the cost for other digital card games. Competitive constructed events are very good for players with consistently high win rates, though they are pretty bad for those who can’t cut it. Draft events are difficult to evaluate at present as the current reward scheme is vague and somewhat subjective. Let’s quickly summarize the changes. Once again, you can find more information about these in the actual post by WOTC to get the details. The Vault has been substantially reworked. The rewards from the Vault are now 2 Rare Wildcards and 1 Mythic Wildcard, as opposed to the 1 random Mythic, 1 random Rare and 1 Rare Wildcard. There have also been some adjustments to the Vault charging formulae, which are explained here. This represents a decrease in the Vault charge given by opening packs, as well as a small increase to the Vault charge given by unnecessary cards. Massive increase in daily Gold income. Though I will need the specifics of quest information to verify the numbers, it appears as if the daily income has almost doubled. In this work I am assuming quest values are 625, which is half-way between the 500 and 750 gold rewards. Individual card rewards that were acquired after game wins have been removed (good riddance). You can now spend real money in the game to buy Gems. Gems, in turn, can be used to buy packs or entry into events. There are now Constructed and Draft Event modes, which you can enter using Gold or Gems. Not only has MTGA’s economy gone through upgraded, this model behind this article has been upgraded too! Below I have explain these improvements and why I made these adjustments. For all other assumptions, please review my previous article on this subject. The first adjustment is the chance of opening Rare or Mythic Wildcards. While the odds of opening Rare and Mythic Wildcards has still not been made public, a WOTC employee mentioned in the community Discord Server that the pity timers had been adjusted to 15 and 30 packs respectively. I am now assuming that the expected drop rate of Wildcards is twice as often as the pity timers, meaning the expected drop rates are 13.33% and 6.67%, respectively. 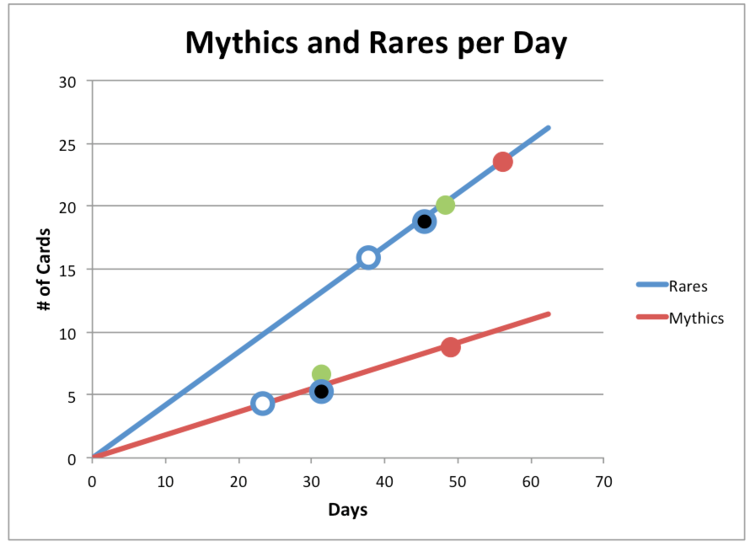 I have also adjusted the chance of opening a “wanted” Rare or Mythic. Last article I simply grouped together the odds of opening wanted Rares and Mythics. This was partly a concession to not having definitive numbers, but it was a hedge in MTGA’s favor, given how critical I was in the article. This month I am basing these numbers on 4 actual decks: White Blue Auras, Mono Green Monument, Mono Red Aggro and Blue Black Control. These decks are not technically MTGA legal, but they give a representative mix of decks that can be used for our purposes. Within these decks there are 21 different Rares and 9 Mythics that appear. Within the Standard format there are a total of 354 Rares and 97 Mythics that are possible to open. This means that a random Rare found in a random standard legal pack has a 5.93% chance of being desirable. If a Mythic is opened, there is approximately a 9.28% chance that it is actually wanted for one of these decks. When preforming my calculations I have taken these figures and multiplied them by 1.5 as an allowance for good collection management. It is difficult to model behaviors like spending Gold only on packs you actually need, or gravitating towards decks you already have the cards for. Using a 1.5 multiplier is a reasonable-but-generous assumption, though I will address this later in the article. Given the specific decks I am using, and this set of assumptions, I estimate that there is a 19.6% chance of opening either a Rare you want or a Rare Wildcard, as well as an 8.1% chance of opening a wanted Mythic or a Mythic Wildcard. The removal of individual card rewards has also prompted me to reverse the assumption that players own a playset of the Commons and Uncommons. I am assuming that none of the cards that are opened go into the Vault, and the Vault is filled entirely by the “bonus” of opening packs. Once again, this was an assumption I fit into the original model as a hedge in favor of MTGA, though it was not particularly impactful. Finally, players now have the option to spend real life money in the game. The specifics are a bit tedious, but to put it simply, players that spend a good deal on the game will get a rate of $1 per pack roughly. Players spending only small amounts will get a rate closer to $1.3 per pack, so I would encourage anyone who is buying into the game to bite the bullet and shell out $50-100. In this article, I am assuming each pack costs $1. Given the updates to the economy, it is much better to start out conversation as a function of packs. Days was a much more important metric when the daily card rewards were a substantial part of the player income, but now everything can essentially be converted to packs. In addition, we know that packs cost $1 each, so the number of packs also roughly represents the number of dollars invested. So, the first question, how long will it take to build a competitive deck? Take a look at this first graph. Below I repeat the same graph, but have put dots on the graph to represent the requirements of the decks specified earlier. The blue circle with white filling represents this White Blue Auras, the green do represents Mono Green Monument, the red dots represent Mono Red Aggro, and the blue circles with black filling represent Blue Black Control. As you can see, most decks are in the range of 60-100$. This is fairly typical for online card games, and is roughly in-line with my predictions from last month. Assuming you are going to be buying into the game wholesale, these figures are fairly similar to what you might see in other games. The starting collection of MTGA is not spectacular, so unlike some other games you don’t get much of a head start, but the price is certainly not outlandish. Now let’s turn to the Free-2-Play experience. Between changes to the Vault, Is this an upgrade to the previous economy? In a word: yes. Once again, I have reproduced the above graph, but with indicators relating to example decks. 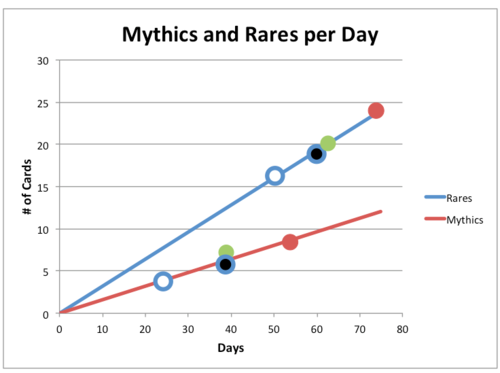 Comparing to the numbers I calculated last month, it seems like wanted Rares are going to be acquired about 20% faster than before, and wanted Mythics will be acquired about 10% faster. As a reminder, this is using a less forgiving set of assumptions for MTGA. Despite the model being less charitable, there is a significant improvement in MTGA’s performance, which is very good to see. When comparing to other games, I can pretty confidently say that MTGA is ahead of Hearthstone in terms of Free-2-Play friendliness. MTGA appeared to be roughly comparable to Hearthstone at the time of the previous article, but it should be noted that Hearthstone Decks were unusually inexpensive at that time. After their most recent expansion and rotation the cost of top tier decks returned to values that were more typical of the norm. At present, most competitive Hearthstone decks would take about 2.5-3 months to build, while most MTGA decks will take between 1.5-2 months. Eternal is still ahead of MTGA, though that is not exactly a fair standard. I would say MTGA’s economy is now much more middle-of-the-pack in terms F2P friendliness, compared to last month where it was only narrowly beating Hearthstone, which is considered the worst-in-class. I would quickly like to note where MTGA might lie if players never opened a useful Rare or Mythic. In the models above I assumed that the chance of dropping a wanted rare could be computed using a combination of 4 specific decks. If you think carefully about things, this logic is somewhat faulty. It is not enough to open 20 random “wanted Rares” to complete the mono-Green deck, you need 20 specific Rares! To address this, I am going to reproduce the above graphs assuming that the only way to pick up cards for your deck was through Wildcards. This is probably a similar experience to what players might expect if they have some particular list in mind when building a deck. These are obviously worse than the graphs above, but the assumptions here are pretty brutal. I will leave you to interpret this data as you will, as I can’t adequately compare these results to the graphs above without making a lot of assumptions about player psychology and preferences. I think even under this harsh set of assumptions it seems like MTGA is ahead of Hearthstone, though obviously not by as wide a margin as it seemed above. Constructed events are a lot easier to process. In reality, “Constructed Events” seem more like “competitive constructed queue”. Given my calculations, it seems like a player with a 50% win rate is going to lose a bit of Gold when playing in events, meaning that there are very real stakes in the event. In fact, a player with a 50% win rate should expect an 87.5% return on investment. You will need a win rate of 55% or higher to “go infinite” in constructed events. You can see a graph below showing the relationship between win rate and return on investment in constructed events. This is, of course, ignoring the cards you acquire as you play events. If you go 4-3 or better you get at least 1 random Rare. Ultimately, I think constructed events are a really great way to give players a path to continue progressing past the first 4 wins of the game, and can super-charge the collection building of players that are truly working for it. I imagine that players who are successful in constructed events would be able to double the speed of their collection building. I anticipate this competitive queue will end up being fairly cut-throat, as the stakes are significantly higher than the normal ladder, but overall I think this is probably a good thing, as it gives competitive players something to do to show off their abilities. I think patch is overall a real improvement for the economy, and although it is difficult to guess if this will satisfy the community, it is certainly a step in the right direction. I feel like there are a lot of people who have been focused on the “two-steps-forward-one-step-back” of the Vault, and while that is valid, that ignoring the massive buff to daily income. As I mention above, I think the daily gold income is almost double what we were seeing before, and people will really notice this after a couple weeks playing the game. The implementation of events is not exactly what I imagined when WOTC first started talking about them. I am still curious on how these will meet some of the goals like keeping off-meta cards playable. We might have to wait for future events to know. While some people are not yet satisfied with the state of the economy, this is clear indication that WOTC has heard the concerns of players, and are working to satisfy the community. More progress would be needed for MTGA to really compete with games like Eternal or Shadowverse in terms of F2P-focus, but that may not be WOTC’s goal. To be clear, I still think MTGA's economy could stand to improve further, but this patch is progress. I still have concerns about the clunkiness and inflexibility of the MTGA economy, but even on that front I think we see some minor improvements in this patch. Thanks everyone for stopping by! Very happy to see progress being made by WOTC. If you have any thoughts, questions, or comments, be sure to check out the Reddit thread! Once again, please check out my other articles on the topic of MTGA’s economy if you haven’t already. Also, I have started writing on some Artifact related topics on this new website, so if you are interested in learning more about that game be sure to check out the content on the site. I would specifically recommend the article on “Gaming According to Garfield”, as it delves into the design philosophy of Richard Garfield, who is clearly an extremely impactful character in the history of Magic.